Concrete Picnic Tables with Steel Frame - Picnic Table Store-Commercial grade quality-lowest price. 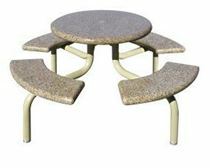 These unique concrete picnic tables have a concrete smooth tops and steel metal powder coated legs. Our concrete picnic tables are so heavy that they deter vandalism such as theft. All of our picnic tables meet ASTM standards. Concrete tables are a great investment as they are low maintenance and withstand years of heavy use. A lift gate is included for delivery on all concrete picnic tables. We have a variety of textures and colors to best match your business needs. The unique combination of concrete top and metal frame makes this picnic table a great addition to your restaurant or school. The concrete will last for years while maintaining quality and the coated metal frame will remain resistant to rust and peeling. A protective sealer on the concrete top and coated on the metal legs provide protection from weather year round. These are the type of picnic tables you would find on a McDonald's or Burger King patio. The low maintenance of concrete makes this an ideal investment.